Romance seems to come naturally against the backdrop of the Smoky Mountains. The area is tailor-made for romantic getaways, with secluded mountain cabin hideaways that are also close to entertainment and town life, and with activities and amenities at hand to suit every whim. Couples come to stay in a luxury cabin to celebrate the anniversary of the wedding they held in the same location years before. Or they come to pop the question and plan their return to seal it with vows. Love and marriage are alive and well in Gatlinburg, Tennessee – the 3rd most popular destination in the world for a wedding. There’s nothing more fun than a romantic escape, especially if you don’t have to arrange all the little details that can take the zest out of the plan. Having everything done for you is the favored plan for romance, and plenty of our guests love to book a package in a luxury rental cabin, leaving them the simple task of relaxing and enjoying. We offer several different 3-night and 6-night romance packages.You can have your cabin provided with extras such as flowers, candlelight dinners and tickets to top local attractions. Or a bed of roses, with chocolate, candles and massage and bath lotions. Yummy! With so many different options, guests can also custom create their arrangements over the phone and have it all waiting when they arrive. Follow this link to check out all our options for romantic getaway packages at our Gatlinburg honeymoon cabins page. We have well over a hundred 1-bedroom cabins ranging from spectacular views to private, secluded cabins. 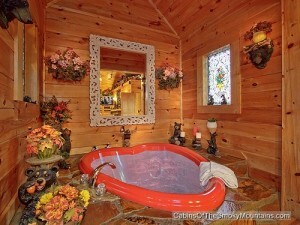 Most of the cabins include a fireplace for snuggling and many of them have hot tubs. AND we have over 30 cabins with heart-shaped Jacuzzis! Somehow the breathtaking scenery of the Smoky Mountains is more than one person needs, we always want to share it with our special someone. Is that mist or simply LOVE that’s in the air, hanging over the valleys and the foothills? ps…If love turns to marriage, as it usually does, be sure to check out our Smoky Mountain Weddings page for everything you need to know about getting married in the Smokies. And for accommodations for you and your guests, choose from over 400 cabins of all sizes at our Gatlinburg cabins, Pigeon Forge cabin rentals or Wears Valley cabins pages. It’s the Smoky Mountains – Let’s Get Married!